Perfecting a method of foretelling and predicting the passage of time preoccupied our ancestors from the earliest recorded history. The unending journey of the Sun, Moon and stars across the great expanse of the sky provides clues for numerous methods of marking time, the most obvious to primitive man being the passage of a day (light/dark) and that of a month (based on phases of the Moon). Measuring the exact length of a year is difficult, but for our ancient ancestors’ less stringent parameters, such as when a certain tree would bloom, was sufficient proof to denote the beginning of a new year. The ancient Egyptians knew that to calculate an accurate measurement of a year, it was necessary to take note of where the stars are in the sky at any given time. Specifically, the priests of Egypt used Sirius, the Dog Star, to predict the flooding of the Nile annually, which gave them the appearance of being able to foretell this event. Studying Sirius also enabled the Egyptians to become the first civilization to switch from a lunar to a solar calendar. The ancient Babylonians utilized a lunar calendar. Even today, the Muslim and Jewish calendars remain lunar-based. Nice, if you like tradition, but using a lunar calendar poses a major problem as well. A lunar month is 29.5 days, meaning 12 lunar months add up to 354 lunar days, which is about 11 days short of a solar year. 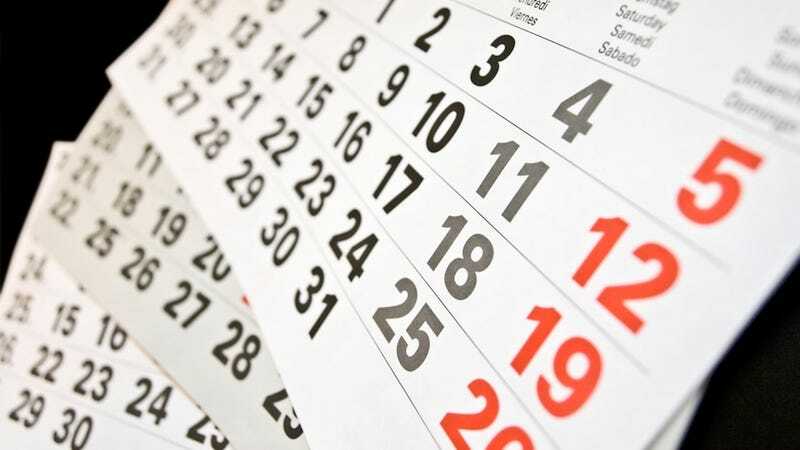 To solve this problem, some lunar calendars add an extra month every now and then to make up for lost time, which is how it is handled with the Jewish calendar. However, the Egyptian priests’ study of Sirius allowed them to count the exact number of days in a solar year. They then arranged the lunar months into 12 month intervals, making each of them 30 days in length with five added days at the end of the year. Sounds pretty good, but there is a problem, which is that every four years Sirius shows up a day late. The reason for this is that the solar year is really closer to 365 days and six hours, which the Egyptians never took into account, though they were aware of the issue. This resulted in the calendar taking a backward slide as a lunar one would do, only at a much slower pace. By the time of the Roman Empire under Julius Caesar, the calendar, which was out of sync by about three months, was in desperate need of tweaking. With the help of Sosigenes, a renowned astronomer from Alexandria, Julius Caesar started a new calendar on January 1, 45 B.C.- a calendar that came closer to the solar year than any of its predecessors and became known as the “Julian Calendar”. Sosigenes informed Caesar that the actual length of the solar year is 365 days and six hours, as the Egyptian priests had known. Sosigenes felt the logical solution was to simply add a day to February, the shortest of the Roman months, every fourth year. This made up the difference, and with this clever idea the leap year was born. This calendar quickly spread across the entire Roman Empire, and was also used throughout Christendom for centuries. And yet, once again, an error popped up. It turns out, that the solar year isn’t actually 365 days and six hours after all. It’s actually 365 days, 5 hours, 48 minutes and 46 seconds. This only amounts to a discrepancy of a single day over 130 years, but when you’re talking millennia you have no choice but to nitpick. By the 1500s, the seemingly minor glitch of calculating the solar year to be 11 minutes and 14 seconds shorter than it is led to about a 10 day gap between the calendar and the real solar year. This posed a particular problem around the equinoxes, which were occurring 10 days earlier than the dates on the calendar denoted they should be. Clearly something needed to be done, so Pope Gregory XIII asked Christopher Clavius, a Jesuit astronomer, to help him solve the problem. Quickly discovering that the error in question amounts to 3 days over a span of 400 years, he devised a brilliant solution to the predicament. The ingenious astronomer put forth the suggestion that years ending in ’00 should from that point on only be leap years if they could be divided by 400. By doing so, three leap years are eradicated every three centuries, providing a tidy solution to the problem. The proposal, named after the Pope responsible for hiring its mastermind (rather than the mastermind), was put into use in the Papal States in 1582. The Gregorian calendar was quickly picked up by Spain, Portugal, France and the Italian states the following year. This was a time of great religious upheaval in Europe, and many of the Protestant states were in no great rush to concede that the Bishop of Rome was right about anything. The Lutheran states of Germany finally got around to making the change in 1700, while Great Britain put it off until 1752. Even though by that point Britain had accrued a sizable gap of 11 days, many people protested violently when the change was made. Further technological advances in the 20th century made it possible to hone the accuracy of the Gregorian calendar even more. For instance, it has been suggested that to fix a small error in the Gregorian calendar, one day should be added every 3,323 years, and years divisible by the number 4000 will not be leap years. So, the next time you’re scribbling down your next dental appointment on your handy-dandy calendar, take a moment to appreciate its long and noble evolution. The calendar so casually given to you during the Holidays sits in your hands thanks to the input of Egyptian priests, Julius Caesar and co. and a Pope and his trusty Jesuit astronomer. On the other side of the pond a calendar had been devised, not unlike the one the Romans had come up with, by a culture in Central America called the Olmecs, and was fined tuned around the first century AD by the Mayans. The Mayans, having concluded that there were 365 days in a year, fashioned a calendar consisting of 18 months including 20 days each. They rounded out the year by adding five days at the end which were considered to be very unlucky. Another aspect unique to the Mayan calendar is what is called the “Calendar Round”, which is a cycle lasting 52 years in which every day has its own individual name – none are repeated. Kathy Padden writes for the wildly popular interesting fact website TodayIFoundOut.com. To subscribe to Today I Found Out's “Daily Knowledge” newsletter, click here or like them on Facebook here.